The kitchens of Bucharest’s restaurants harbor a number of internationally renowned foreign chefs. Romania-Insider.com talked to expat chefs about work, food and life in Romania’s capital – check this section as more will follow in the coming days. 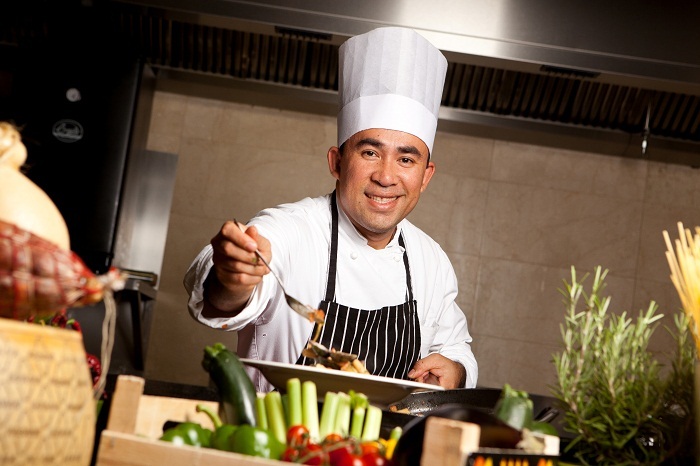 Chaiyasith Srichom (nicknamed Lam), Chef @ Athenee Palace Hilton. Before Romania, Bangkok- born Lam also worked in Sydney, London and Prague. What brought you here in the first place? I was sent as part of a task force to help in the opening of the Roberto's Restaurant. What is your favorite place in Romania? So far it's been very busy so I have not yet had the pleasure to experience anywhere other than here in Bucharest, which I really like. I hope I will soon have the chance to visit the mountains and other cities I was told are very beautiful. Where else in Romania have you worked before your current position? Bucharest is the first city where I've worked in Romania. What is your favorite Romanian food? I like all the different types of preserved meats and sausages, and the pickled vegetables, like the water melon and green tomatoes are a real treat. I also love the local beer. What is the one recipe you love to cook? I love making fresh pasta and fresh noodles. How did you learn how to cook? In the beginning it was from my mother that I learned to appreciate the basic ingredients like the fresh vegetables we had growing in our garden as a child. Then I entered the world of cooking professionally. Tell us about an adaptation of a Romanian recipe (if you have any). We try to bring the traditional recipes forward by giving them more glam, these days people are watching their health, so we try to cut out fats and use better quality oils when possible and present the dishes in a more modern way. What sort of recipes sell better in Romania, from your experience? I would have to say right now its Italian recipes but Romanian people have started to travel more and further, going to places like Thailand, Vietnam etc. and the taste is completely new. These new flavors might soon become the new trend. To what extent do Romanians appreciate more uncommon recipes? Are they traditional or do they like to try new things, in your opinion? I think Romanians, from what I have experienced, are very open to try new things, from what the Romanian cuisine is based on and the history of the country, the people had very little choice but to eat what they could to survive during the hard times and I think this helps them overcome the fear of the unknown when it comes to food. What was the biggest kitchen 'disaster' in your career? How did you solve it? The biggest disaster that we had to resolve was when we experienced miscommunication between sales and the kitchen - we had to put together a buffet for 120 people and we only had three hours. Luckily on that day we had enough cooks available and we managed to put it together; the event was a success because of hard work and team work. Who is your favorite Chef (in the world)? On the interne,t a show called Michelin madness featured this English chef called Michael Cain who worked in France in a three Michelin star restaurant. The way he described the environment was very exiting, it made you want to be there and cook. Some time later, he lost an arm in an accident but it did not disable him, it just made him more humble in his approach to food and people, he is now running a chain of hotels in the UK all with Michelin stars so I have to take my hat off to him. How many people currently work in your kitchene? We have 37 talented team-members who build a great kitchen team. What is the first thing you usually do in the kitchen at the beginning of the day? I make a point to greet my team and have small light conversations, this helps us to start on the right foot for the rest of the day.